If you are on a tight budget and looking for a cheap option to enhance the looks of your garage floor, then look no further than paint. That’s right. If your floor has become more of a distraction than an attraction, you can paint a typical two car garage floor for as little as $30 – $40 in paint from your local home improvement or hardware store, plus the necessary supplies if you don’t have them. Maybe the rest of the garage is clean and orderly but the floor draws attention due to some dated stains and repairs. Or, maybe it’s just old and worn looking with a few cracks and some pitting. To top things off, you are on a tight budget and just want to rid yourself of the eyesore your garage floor has become. With some good old fashioned elbow grease, you can paint your garage floor in a weekend and completely alter the look of your garage. Garage floor paint has been around for many years and hasn’t shown signs of leaving anytime soon. The reason? It’s cheap. There is nothing else on the market that can transform the look of a garage floor for less amount of money. As an example, a gallon of Epoxy-Seal Concrete and Garage Floor Paint can be purchased from your local Lowes right now for less than $35. It’s a simple latex acrylic concrete paint with a little bit of epoxy resin added for increased durability. With a coverage rate of up to 500 square feet, it will be enough for one coat for most two car garage floors. You may even have enough to apply two coats for single car garage. Rust-Oleum Concrete Garage Floor Paint + Primer is another example. Menards currently sells this for less than $35 per gallon as well. The coverage rate is less, so you may need two gallons for a two car garage. Will it last forever? No. Paint will wear out. It can also start to flake and peel prematurely if the floor was not cleaned properly. You will most likely experience hot tire pick up at some point as well. Expect a paint application to last about a year on a garage floor with moderate traffic. The nice thing about using paint, however, is that it can easily be touched up or reapplied when it starts to show signs of wear. Just run a scraper over any areas that are peeling, clean the floor well, and then touch up or add another coat when the floor is dry. Try to stay with a light color if you want to take advantage of good light reflection off the floor in your garage. Light tans and grays are the most popular and are also neutral in color. If you live in a wet climate and are worried about paint making the floor slippery, you can purchase an inexpensive anti-slip additive to add to the paint. One of the advantages to paint is that you are not limited by these colors if your palette and style dictate something other. If it’s in your budget to splurge a little, you can purchase a bag of paint chips to spread on the surface to add color and texture to the finish as well. Do not get the idea to add a clear coat afterwards. Acrylic garage floor paints are designed as a stand alone product. This article about clear coats explains why. 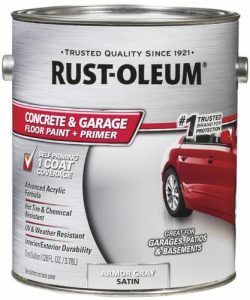 Are better garage floor paints available? If you can afford to spend a little more money, 1-part epoxy paint will give you a better value for your dollar. Because they use epoxy resins in the paint, they will adhere better to the concrete and provide for a slightly longer wearing surface. They are just as easy to apply as latex acrylic paint and will do a better job at resisting hot tire pick up, though they will not always prevent it. Your color choices are limited with epoxy paint, however. The key to getting the best life from painting your garage floor is to make sure your concrete is cleaned and prepared properly before you apply it. Make sure all oil spills are cleaned up first. TSP or powdered laundry detergent and a stiff brush work great for cleaning concrete and are inexpensive as well. One recommendation we can make is to use a combination concrete cleaning and etching product. These are environmentally friendly and you can usually pick these up for less than $15 from your local home improvement center. This will gently etch the finish of the concrete and open up the pores so that the paint can adhere to the surface better. Let the floor dry overnight and you can start painting the next day. Paint is far from the best option for a garage floor. However, we feel that under certain circumstances there are some compelling reasons to use it. If money is tight and you live in an older home with a worn out looking garage floor or if you can’t afford to repair an older floor that has some cracks and pitting, then garage floor paint can be a good solution. It will literally transform the looks of a garage for very little money. It will also help protect your garage floor surface from further damage since it will not allow the concrete to absorb water and other damaging fluids as quickly as bare concrete. If at some time you decide to make repairs and want to apply something better such as an epoxy coating, it’s not that hard to remove with a floor grinder. You can also leave it as is and install garage floor mats or even interlocking tiles over it at a later date. While not the most practical choice, garage floor paint can enhance and improve your garage floor for little money invested. If you are on a budget and are looking for a cheap garage flooring option, then paint may be the answer for you. our home is about 4 years old. the garage was painted by the builder a light gray color. it is difficult to mop/clean and has stains. i want to make an improvement. what options do i have to cover it? i want it to not only look nice but have ease of clean up. i’m not interested in removing the current paint as it sounds labor intensive. please help. thank you. When you state options Julian, do mean any garage floor option or are you just referring to paint or a coating? Do you know if your garage floor is a paint or a coating? Is the current flooring peeling up or just dirty? Yes. I agree that surface preparation is critical. Almost all paint that peels immediately is due to poor prep. But floor prep is probably a different article. The only other step to add would be moisture testing the concrete. A simple square of clear plastic 12 inches by 12 inches taped to the floor for a few days will reveal if any moisture is permeating. If you see moisture build up, do not paint. There are some exterior stucco and brick paints that do claim to be breathable. But your mileage may vary.